Do You Need to Use a Yoga Mat? A yoga mat makes you feel as if you've arrived. It marks your space in class and can sometimes act as a status symbol as people admire its design, logo or cush-factor. But is it really a necessity or just another accessory born from the Westernization of the practice? 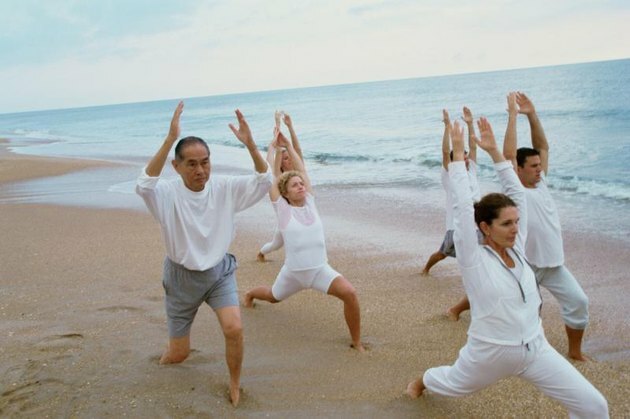 Yoga was originally practiced on grass, then on skins of animals, such as deer or tigers. The animal skins provided a bit of protection for sensitive skin and offered more cushioning and stick than the bare ground, especially when it came to trickier postures. You may choose a mat-free practice, but at your own peril. If you mainly sit in seated meditation on a carpeted floor, you'll be just fine. If you plan to stand or balance on your hands, spend time on your abdomen or back or kneel in Camel or Cow-Cat, you'll want the cushioning, stick and insulation of a traditional mat. Read More: What Makes a Good Yoga Mat? Using tiger skins, especially those from animals who died a natural death, became rather impractical as the practice of yoga grew in popularity, particularly in the West. Early 20th-century yogis used towels and cotton mat-like sheets to support themselves, but in 1967, an English yoga instructor named Angela Farmer, improvised with a piece of foam carpet padding to create a makeshift mat. Her idea took off, and Farmer's father contacted the carpet foam manufacturer to create retail yoga mats. The production and design of yoga mats continued to develop through the 1980s and 1990s, with yoga mats now coming in hundreds of varieties. Many are made of PVC, a type of plastic, because it's long-lasting and cleans easily. 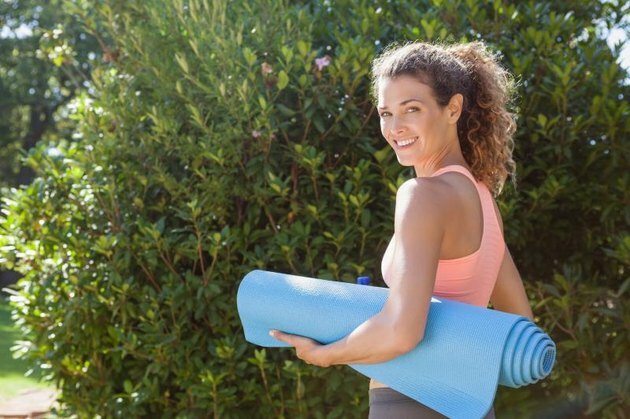 TPE, or thermoplastic elastomer, is another common yoga mat material. It's a combination of rubber and plastic, and may be more environmentally kind — some types may even be recycled when they're worn out. Yogis aren't just about performance, though, when it comes to a mat. Yoga mats are also crafted from natural materials, such as jute, natural rubber and cotton. Although these materials get high points in sustainability, they aren't always as functional as the standard PVC mat. If you're participating in a restorative or Yin practice, in which most of the poses are spent lying on the floor or seated in variations of Forward Fold, you might use a folded blanket or beach towel in lieu of a yoga mat. These surfaces are inappropriate for any practice with standing poses, as they'll promote sliding. A thin carpeted floor with a low pile might offer enough stick for some poses, such as Warrior I or Tree pose, but you'll be at risk of sliding when you're in Downward Dog or even Crescent Lunge. Yoga on a wood or laminate floor isn't really practical without a mat. The surface is hard and will be painful on your knees, hips (when you're in Bow, for example) and back of the skull. When you're feet and hands produce a little sweat, you'll likely slide. And, a hard floor is a poor conductor of heat, so it'll feel awfully cold to your body, especially in reclined and restful postures. If you happen to be outside and want to do an impromptu session under the trees, nothing says you must have a mat to be a yogi. Connect with the dirt, the grass, the sand — whatever you have, but watch for rocks and roots that stab into bare feet and hands. You'll be welcome in a yoga class without a mat, even though you might get a few stares. It's up to you as to whether you find it completely uncomfortable to practice on the bare floor. Know that most studios will have mats that you can borrow or rent for a small fee if you don't have your own. What Are the Different Types of Basketball Court Surfaces?